Satya has created Elegance Colors, a new chameleonic Gnome Shell theme that changes colors with your GTK3 theme and desktop background. If you are using any other distro, download the package from here, extract it and run install.sh script. Start the Elegance Colors background process from the menu. This process will automatically start at every login. 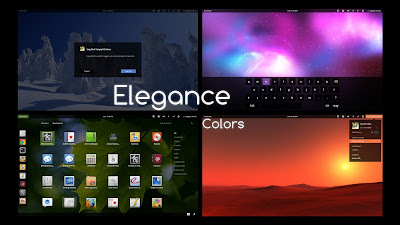 Set "Elegance Colors" as your Gnome Shell theme by using User Theme Extension and Gnome Tweak Tool (can be installed from Ubuntu Software Center). A configuration file .elegance-colors.conf will be automatically created in the home folder during installation and you can edit it to set your preferences. For example 'automatic' option will derive color from the GTK theme, wallpaper - according to your wallpaper, other - use your own defined color. By default, 'automatic' option is enabled. If Elegance Colors fails to get the color from the GTK theme or wallpaper, the user defined color will be used instead.